Art Option 1: This option schedules artwork along with four art objects to view. All the artwork is linked to internet sources and you can view them online or you can print the paintings out to view and then add them to your art notebooks. Art Option 2: This option will be art appreciation with a plan for learning to draw. Coloring pages for most of the art time periods are included in the back of these plans for you to print or copy. Art Option 3: Option three will use Artistic Pursuits Grades 4-6, Book One for lessons in art appreciation as well as working with drawing pencils and ink pens. Please note that this book features American Artists and will not tie into your study of ancient art. NOTE: The Artistic Pursuits book scheduled in these plans is the Second Edition. If you get their current version of this book (Grades 4-5 Book 1) you will need to use the Table of Contents in the AP to coordinate the lessons. Composer Study: The Harmony Fine Arts for this level cover the instruments of the orchestra. Each week will have a specific instrument or composer to listen to and learn about. 32 weeks of planned study, including 9 custom notebook pages and 19 coloring book pages. You can view an example week in action: Example Week for Harmony Fine Arts Ancient Art and the Orchestra. Option one includes all links for every featured work to study. Option two includes simple art activities to enhance option one picture study if you want a more complete art appreciation plan. Option two includes a step by step drawing book to go along with your study of Ancient Egyptian art. Option three is a schedule for completing Artistic Pursuits Grade 4-6 Book One. Please note that the Artistic Pursuits book covers American artists and will not tie into Option One or Two. Music appreciation plans that include online listening, a study of the instruments of the orchestra, and an overview of classical music using the book, Story of the Orchestra. You can view the resources needed below. DK Eyewitness Book – Ancient Egypt: Purchase a good used copy or you could try the revised edition. DK Eyewitness Book – Ancient Rome: Purchase a good used copy or you could try the revised edition. Ancient Greek Art: Purchase a good used copy from Amazon.com or you can try finding it at Rainbow Resource. Art in History – Prehistoric Art: Purchase a good used copy from Amazon.com or you can try finding it at Rainbow Resource. Artistic Pursuits Grades 4-5 Book One: Purchase this resource from Artistic Pursuits directly. The Harmony Fine Arts plans for this year are written for the original book titled Grades 4-6 Book One. 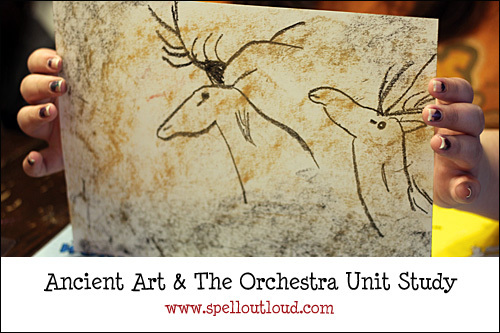 Read a review from a family who used Harmony Fine Arts Ancient Art and the Orchestra!